Maybe it is my relative youth in the world of optometry, but trying out a new contact lens product still really excites me. For the past few months, I have heard a constant buzz about Ciba's new daily lens material that is being used in the freshly launched in America DAILIES TOTAL 1. The product is a water gradient delivery system, (for more information read here) that aims to prevent the contact lens from pulling water from your eye to stay hydrated, the culprit causing end of day dryness in so many contact lens wearers. Whenever anyone tells me they have the newest, latest greatest anything, I am always suspicious. When Ciba declared this lens "a game changer" it sounded to my skeptical ears like a product destined to flop. When I saw the packaging (it looks like a toothpaste box) and saw the obnoxious ALL CAPS in the nomenclature, it grated on my contact lens critic nerves. But Ciba is on to something with this lens. My rep for the company kept telling me that frequently when someone puts on the lens in front of him, they say they can't feel it. So I decided to test drive it for myself. I put the lens in. I tried to feel it. I really did. But Ciba won round one: I could not even really convince myself that the lens was on my eye without looking in the mirror. It was that comfortable. I also have to admit that I am a tough critic for more reasons than just my skeptical nature. I have very dry eyes with contact lens wear, and I typically wear my glasses 5 days a week, as much for comfort as for style. I have only a few products that I really swear by. Avaira is the only multiple wear product I can stand on my eye for longer than a few hours. Proclear 1-Day used to be my lens of choice for comfort, but about 12-14 hours in, I would have to manipulate the lens under my eyelid to try to relieve dryness, or use a re-wetting drop. Then I discovered Acuvue 1-Day Moist. This has been my favorite product for nearly 2 years. I wear this lens comfortably late into the day and on airplanes. But I still find I get issues with comfort and lens awareness around that 14 hour mark. 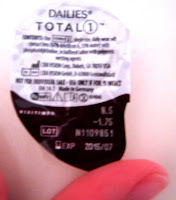 The DAILIES TOTAL 1 is the first contact lens that I have worn where I really didn't get lens awareness until close to 16 hours into the day. I was able to wear them with acceptable comfort all the way to the 18 hour mark. I really didn't even start feeling like I had a contact lens in my eye until 6-8 hours of wear had passed. And did I mention that some days I was wearing this lens under exceedingly poor circumstances? I have a lot of grass and pollen allergies that typically make my lenses feel like steel cages in my eyes after being outdoors for a few hours, but the Dailies TOTAL 1 still felt comfortable after spending 4 hours outside. I am a contact lens cynic, and the type of patient that typically finds no true satisfaction with contact lens wear, and now I am a believer that we really do have a new product to offer patients that can truly help make their contact lens wearing life better. Now is this lens perfect? No, I still got a little dry and irritated towards the very end of my (very long) day. But I was able to wear the lenses comfortably longer than with any other contact lens I have ever put in my eye. I had good vision (I wouldn't say the clarity was a real remarkable point, but it was at least as good as any other daily lens I have been wearing over the past 3-4 years). The major drawbacks are going to be availability and price. The lens is only available in minus spherical powers (no astigmatism, no multifocal, and no plus!) so only a certain population of patients will even be eligible to wear the lens. Ciba does plan to utilize the science of their water gradient technology to expand into different lens types, so larger ranges of vision issues can benefit. Price is going to be a huge factor, and like any premium product new to the market, it is priced accordingly. You won't be able to find this lens for much less than $100 for a box of 90. Compared with the price of even other dailies on the market, you will definitely be paying a premium to enjoy the extra benefits of this lens. Try this lens if you feel like you have never really had a comfortable contact lens for one reason or another: dryness, lens awareness, redness, allergies. This lens may be the closest thing available to solve your problems. Try this lens if you want to see what the best contact lens technology for comfort on the market can provide. Try this lens if you are a skeptic; maybe you might become a believer too! Disclaimer: I am in no way affiliated with Ciba and was not compensated for trying their product or writing this post. I made the switch over to Dailies Total 1 and absolutely love them! My only concern is that they are not widely distributed at the moment and buying them from your eye care provider is VERY expensive compared to other daily lenses! Price is definitely a premium with this lens and CIBA (the manufacturer) has done a very limited roll-out to keep prices competitive. At this point, the lens isn't available with companies that are only retailers (like 1-800 Contacts), and only with practitioners. In a few years, expect pricing to get more competitive as other companies rush to compete with new daily materials of their own. I wouldn't expect to find this lens much less than $100/90 pack for the near future. We recently got these in Canada. I was given a sample set of five from my eye care provider. I was warned that I would love these as they are so much more comfortable. I rarely wear my contacts as it is these days as I am a stay at home mom now. Often when I go for any extended period of not wearing contacts they hurt/aggravate for the first few hours of wearing them. These didn't hurt at all! I wore them for nine hours after months of not wearing any and I had no complaint. My usual pair need to be rewet after only a couple of hours. I am floored by how amazing these are, but appalled by the price. I was even told they would be costly when I got the samples (about $800 a year) and after searching online I am saddened that the price wasn't far off nor could I find them online for any sort of discounted price. I am really hoping that next year after these have been out for awhile (and probably duplicated) they drop down in price some. I don't mind paying for the quality, but even my good benefits wouldn't cover half the cost. Hi Kristen! I am not sure where to purchase these outside of the US but your optometrist should be able to help with local vendors. That $800 price tag is for an entire year's worth in both eyes. If you don't wear lenses every day expect a box of 90 to cost about $95. That may be enough to last all year if you wear them very infrequently. Hope this helps! Hi Kristen. They currently sell them at the optical located inside Loblaws / Real Canadian Superstores and Costco. I purchased them earlier this week at Loblaws: 90 lenses (45 pairs - single eye prescription) for $90. They cost a bit more than the average daily lenses, but if you don't wear them as often and are looking for comfort and quality, these are a good fit. 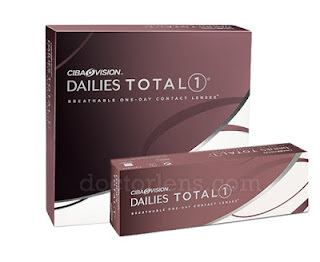 I recently tried Ciba Visions Dailes Total 1 as a recommendation from my eye care Doctor. I have very sensitive, dry eyes, along with a small astigmatism in one eye, so I am very limited as to what contact I can wear. I have been wearing Accuvue's 'TruEye' dailes for about the last two years or so and have truely loved them. I tried the 'Dailies Total 1' just to see if they were any better than my current lens but they are not. The Acuvue 'TruEye' lens is far superior. I can wear the 'TruEye' lens longer, without drying my eyes, and I notice them a lot less at the end of the day. The 'Dailies Total 1' was fine for about the first 6 or 7 hours of wear, then they started bothering my eyes. I am going to stay with the 'TruEye' lens, for it is still the best lens on the market! That's the great thing about seeing your optometrist and trying out new lens technologies-- there are so many new contact lenses, you won't know which one works great for you without experiencing them first hand! Every lens won't work for every person, so you have to have a great relationship with your doctor in finding the lens that makes you happy. So I tried these at my last eye apt. and totally love them. Are they strictly one day wear? My doctor implied that it would be ok to wear the same pair for a second day if I stored and cleaned them properly. Unfortunately they haven't been studied for longer than 1 day of use, so until they are FDA tested for such, I would advise against it. If you were to have any issues with infection or scar tissue formation, you wouldn't have any legal standing if you were overwearing the lenses past what the FDA has approved. I always side with the legal approval on these things. These lenses are not made to be stored in solution, so "storing and cleaning them properly" isn't really an option. The water gradient is unique to this material and would be affected by being placed in solution for any period of time. I have been using Moist and recently tried Dailies Total 1. They did "feel" comfortable but at the end of the day I could not get them off my eyeball! I tried them for three days. I used moistening drops throughout the day, tried applying a moistening drop directly onto the lens before putting in my eye, on one occasion. The lenses would not come off my eyeball no matter what I tried... loads of drops, pushing them in every direction, pinching the lens, flooding my eye with saline solution... nothing worked! Well that is to say, nothing that was suggested to me worked. I had to resort to gliding my fingernail underneath the edge of the lens to peel them off. At least the Moist lenses will come off with only a few moistening drops. My vision is better with the Moist also. You are not the only one that has trouble taking these out! The curvature of your eye and the moisture level of your cornea and eyelid just might not work well with this lenses makeup (chemically and curvature). A great example of how there is no 1 perfect contact lens that every nod can wear . I am glad you have had good success with Acuvue's daily! I am so glad to see this review. I received a sample pack of Dailies Total 1 from my eye doctor and loved them as well, however I am hesitant because this is in the same line as the Focus Dailies I wore a few years ago before switching over to B&L SofLens Daily. When I used the Focus Dailies, I had problems getting them off of my eye all the time. One contact even ripped in half when trying to get it out of my eye, which was a trip to the eye doctor and some prescribed eye drops. That is when I switched and was told that when a patient called in for an appointment for a lens issue (ripping, stuck in eye, whatever), their first question was, "Was it a Focus Daily contact lens?" I am fearful to get back into any "Dailies" lens and will probably stick to my B&L, even if they do feel a little dry after 12 hours of wear. use Dailies TOTAL ever ! They need to come with a tiny suction cup so as to get them off the eyeball. I also have trouble taking them out, just can't seem to grab them, they are so slippery. I agree the same features that make them so comfortable I can hardly tell they are in my eye sometimes, blinking over them is great, is probably the same feature that makes them comfortable to use. Curious, does anyone have a problem discerning whether the Dallies 1 is inside or outside. I wish they had numbers on them like Acuvue. I used the curve method, also the bend method and thinks works sometimes, but there are occasions, I just can discern a noticeable difference when I flip it in and out. Is there a recommendation for a lens like Dallies 1 but has numbers on the lens to discern correct insertion? You may like Acuvue Oasys 1 Day. It's similar in comfort to Dailies Total 1 but easier to detect inside out positioning. Acuvue lenses have a prominent blue tint along the edge of the lens when it's correct, and when they are inside out you won't see the blue. You have to have completely dry fingers to take the dailies total 1 out. Dont add moisture or that just compounds the problem. Dry fingers and they pinch right out. I also could not get these out when I tried them on at my optometrists office. I've been wearing contacts for over 30 years. I had to have my optometrist take them out for me! There's no way I'd ever buy them. I'm trying to understand what is wrong. Everyone seems to love these. I just tried them at the eye doctor and was given a few "samples" to take home. These do not feel at all comfortable and as one other person mentioned, are harder to remove from your eye. I still find the dailies aqua comfort plus works better for me. Just remember, if 1 contact lens worked for everyone, they would only make 1 lens. It is great to try new things out to see if you can find something better, but don't get discouraged if you don't find these lenses to be your favorite. Everyone's eyes have a different shape and chemistry, and no one product is a cure-all! That's what your eye doctor is here for, trying new materials out and finding what works best for your eye's own chemistry! i just got a trial pack of these after having a bad experience with the regular dailies by ciba vision and WOW these lenses are amazing! i cannot feel them and have had no trouble getting them in or out. they do not dry my eyes out like most other contacts have. i'm so thankful for this new innovation, i thought i was going to have to give up on ever wearing contacts again. i'll be ordering some in for sure although my optometrist didn't tell me the prices which does scare me a little! "Currently, we do not have any information about releasing the plus powers in the Dailies Total 1 lenses." Yes! This article is old (2013) and since then Alcon has expanded the lens parameters greatly. I ordered the Ciba Vision DT1 online but what I received instead was an Alcon brand. Also the captions on the boxes were different. The Ciba Vision caption showed "Breathable One-Day Contact Lenses" while the Alcon one shows "Water Gradient One-Day Contact Lenses". Is there a difference? Ciba and Alcon are the same company, so as long as it says Dailies Total 1 it would be the same lens. Ciba is just the contact lens division within the Alcon ophthalmic drug company, which is itself just the eye division of the larger pharmaceutical company Novartis. Confusing enough, right? Lol. Too many divisions, but makes sense now. Thank you for getting back to me. Have been wearing contacts for 20 years w/o problems...always satisfied with my lenses. Used Acuvue almost exclusively. Tried DT1 for 6 months, because Optometrist recommended them. I felt like I was pealing a layer of eyeball off each time I removed the lenses from my eye. Not sure how I did it for 6 months! Though I was going crazy, as all the reviews were great. Glad to see that it isn't just me that had problems. Found a stash of left-over DT1 lenses in a drawer. Don't want to use them, but feel that tossing them would be a waste of money. They were so expensive! Tried Acuvue Trueye. Like them. They are comfortable, cheaper, and remove easily! Will be sticking with Acuvue. They are comfortable lens and I couldn't really tell they were in my eyes until later in the day. But they did start feeling more like most other contacts I've worn after a certain amount of time. They were harder to grab to take out but never actually stuck to my eye. I stop wearing them because of the price fixing UPP mess and also for some reason I saw ghost type images a lot of the time, When I look down. It was like a double image but would correct itself usually if I blink more. I've read other comments about this happening with some people. Also up close vision was worse with them. But the way the major contact lens manufactures have come together and stopped online discounting on certain products, its big time price fixing with a monopoly. Plus class contacts as a medical device. I hope the US senate will actually continue looking into this and have more meetings about it. I know some states are looking into it also. Definitely I am hopeful that we get better legislation for treating contact lenses like the medical devices they are-- that would mean better safety and hopefully better insurance coverage for all wearers. Retailers that make profits on contact lenses being sold in bulk always try to fight this type of legislation since they don't accept insurance payments so would be unable to sell contact lenses in the same way. The battle is ongoing and not likely to be soon resolved. The good news is that companies like CIBA are still working to bring new products to market despite the high competition so we can try new technologies and hopefully acheive better relief for contact lens wearers everywhere. I encourage everyone to try new products as they become available. This one may not be right for you, but there are so many great options coming to market every year, it is always worth exploring to make your vision and comfort better! 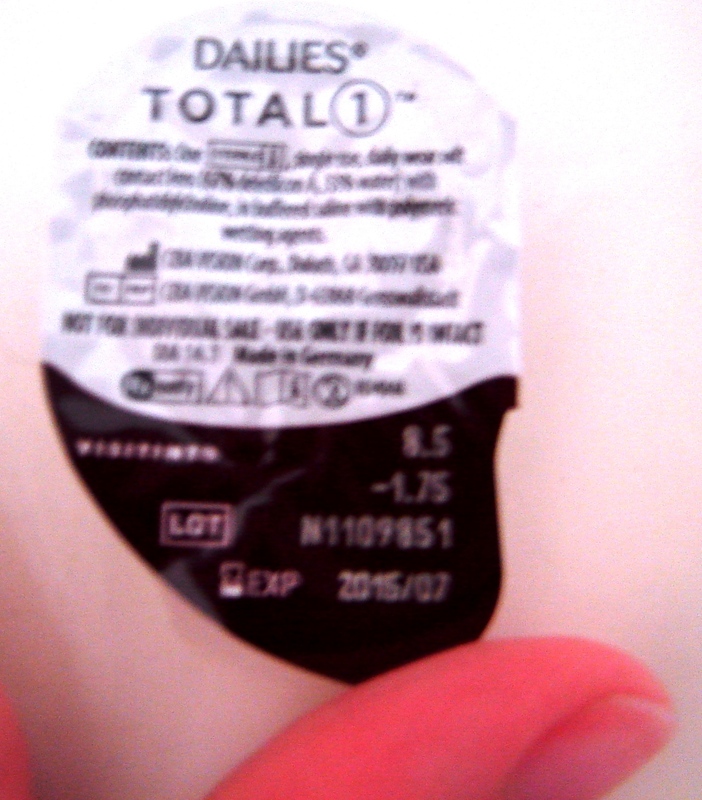 I just got a sample of the dailies total 1 today and now I am a little concerned with them sticking to my eyes as I have such trouble with dryness. Can you damage your eye by peeling them off?? The thought of that kind of scares me? What is a general rule of how many hours you should try wearing if it's been years since you last wore contacts? These lenses are difficult for some to remove because they have such a low coefficient of friction-- your fingers may slide right over them. The good news is that this same characteristic makes them ideal for patients with dry eye. Your eyelids should glide right over them as you blink too! A good rule of thumb for first time wearers is shoot for 4-5 hours of wear on day one. Then add one to two hours every day until you have made it to a full day, typically 14-16 hours for contact lens wear. These lenses are the least likely lenses on the market to stick to your eyes before removal but are some of the hardest for people to grip to remove, so if you have to use too rough of an approach, you may inadvertently scratch your eye. Please let your doctor know if you are having difficulty so they can help, either with more removal training to make you comfortable or with a prescribed dry eye regimen to better help your eyes tolerate contact lens wear. Thank you so much for the response!!! I appreciate your input! I thought they were great until I got 2 boxes with lens folded up and scrunched up and cause blurry uncomfortable vision. And Alcon and Pearl Vision say it is me being sensitive. Yes I have to throw out nearly every other contact in some boxes, it's extremely frustrating quality control, because when I do get a good pair, I love these contacts. They don't dry up, and are more comfortable to wear for extended periods of time, but the quality is so hit or miss I'm considering going back to my old kind. It is possible to get a bad "batch" of lenses with any product. When you purchase contact lenses from a private doctor's office they usually have no trouble replacing your lenses for you if they contact their company representative to report a quality issue. I've always had great customer service at Alcon getting lenses replaced if a quality issue is reported. YES! I have the same exact problem with folded up lenses and they act like its normal. I was also told to open the package and let the lens sit over night in a solution..but whats the point in a daily if I have to treat the contact for a day before wearing...there goes that whole convenience factor. Thought it was just me. Just a heads up-- if you don't see your post appearing and you've commented about the length of time you wear your lenses I can't publish your post due to FDA guidelines. As a doctor running this blog, I ethically and morally can't condone lens overwear. If you were to get an infection or something worse I would never want to allow information on this page that would lead you to think it was safe. Please understand that I'm not blocking your comments out of any other reason than complying with FDA regulations -- this lens is only approved for 1 day of wear, and legally I cannot recommend wearing it for longer than this. I make no sense to overwear 1 day contact lenses or try to clean them. After use they are finished.. and can only damage your eyes. I love these contacts. I have terrible dry eye an I've tried Acuvue Oasys and Air Optix and both felt like sandpaper after about two hours of wear. But with Dailies Total 1 I can't even feel them in my eyes. It's glorious. I can usually feel the edges of the contacts every time I blink, but with these, my eyelids glide right over them. The only issue I have with them is when I look at my computer and phone screen it's bright and causes a glare. When I look down at my phone I see double and it's kind of blurry. Do you know why this is happening or has anyone else had this issue? It might be my slight astigmatism but this didn't happen with my other contacts that didn't have astigmatism correction either. Glad to hear this lens is so comfortable for you. Definitely schedule with your doctor about the vision issue. This lens sometimes needs a step up or down in power than you would wear in other lenses to achieve the same clarity. If you can't get clear vision in this lens you may see better with a similar high moisture daily lens product like MyDay or Acuvue Oasys 1Day. Hi: I was used to Dailies -2.75. I tried Total 1, same power, and I got blurry vision like my eyes were dry. Should I try step up in power or step down? I could not see well at long range. Middle range was OK and short range also had glare. Honestly there is no way to know whether you need stronger or weaker without seeing your doctor. This lens is sometimes unpredictable as to whether the power holds true or needs to be compensated. If vision continues to be a problem, you might want to try MyDay or Acuvue Oasys 1-Day -- they tend to run truer on refractive correction in my experience. Hi! Are the total 1 still the best option for those who suffer from dry eyes and need a daily lens? Or something new and better has come out in these last 2 years? Thanks! Dailies Total 1, MyDay, and Acuvue Oasys 1-Day are the three best dry eye lenses we have now. Some people prefer one over the others, but I find them all equally comfortable. The Proclear 1 day contact lens has been reported very effective for helping out with dry eyes and it is one of the cheapest contact lenses on the market.. The PC technology used in the lense have a good outcome for dry eyes. Another one is BioTrue ONE day and the lense also have UV protection..
All of those lenses have really high oxygen transmissibility (Dk/t), and while yes, in higher prescriptions the actual Dk/t of your lens is lower than what it would be on a lower Rx, all of these lenses have some of the highest oxygen transmissibility available on the market. You can really pick any of these that you like best and expect healthy eyes and clear vision. Hi Dr. L - Hoping that you can help me! I tried out and then purchased a years supply of DAILIES TOTAL 1 about two months ago. I tried a few other brands but these were amazing. However, as time went on, I found that I had the same issues as some of the comments above where my vision was blurry in certain scenarios (From above: The only issue I have with them is when I look at my computer and phone screen it's bright and causes a glare. When I look down at my phone I see double and it's kind of blurry.) I was able to figure out that the blurriness was coming from my right eye. I went to the doctor and we checked my prescription which was one measure too powerful so I tried the lesser strength but the issue persisted. I went back to the doctor again and he said that, as far as he could see, the contacts fit just fine. I mentioned that I had read that sometimes an astigmatism can cause contacts to fit improperly so he rechecked for an astigmatism and said that I did not have that. I left the office that day with new brands to try out so that we could replace the DAILIES TOTAL 1. Here I am now, two months later, sad that there is an unidentified issue with the DAILIES TOTAL 1 and ready to replace them with a new brand only to find out that since I participated in the rebate program and cut the SKUs off of the box that the DAILIES cannot be returned. If I want a new brand, I will now have to pay for ANOTHER year's supply out of pocket. I am writing here because I am a bit desperate to figure out why these contacts were causing blurred vision in my right eye with hopes that I can use the ~$750 worth of contacts that I am now stuck with. If it helps, I was previously using Biofinity (monthly) and was going to replace the DAILIES TOTAL 1 with Clariti 1 Day. Also, I did notice that the size of DAILIES TOTAL 1 was a bit different than my old Biofinity but, again, the doctor said that should not cause this problem. Sorry in advance about this answer: I unfortunately can't explain why you may experience worse vision in this lens verses another. We can theorize that maybe the material difference or the aspheric optic design of Biofinity gave you better vision compared to dailies total 1. Some people just don't have success with a lens and it is simply because the chemistry of the lens material and/or optic design just doesn't match with the chemistry or anatomy of your eye. Without examining you personally, I can't make a suggestion about what specifically might not be working for you. If you bought your lenses at your doctors office, they may be able to contact their Alcon representative to see if there is any way to return your lenses for even partial credit despite the opened boxes. I'm not sure if the company reps can work out anything, but it's the only thing I can think of to try. Not every lens works for every person, and this one just didn't work for you. I have this same problem. My old contacts (same power) work fine but the Dailies total 1, after performing fine for a few months, blur up - usually in my right eye, occasionally in my left. I presumed it was poor hygiene on my hands (maybe a little oil on my fingers) so I've been fastidious about washing hands first but it makes no difference. I have no blurriness in my glasses and no blurriness with my old contacts. It's very odd and frustrating because these contacts are otherwise more comfortable and worked fine for several months. The 2 most likely explanations: 1. The curvature of your cornea is too far off from the curvature of the contact lens. Dailies Total 1 only comes in one size and shape, and contact lenses are not one size fits all. Or 2. Your personal tear film chemistry has a mixture of oils and proteins that adheres too greatly to the contact lens surface, causing clouding. This is potentially treatable with lid cleansers, nutritional supplements, and prescription strength dry eye drops like Xiidra or Restasis. Your doctor will best be able to pinpoint your culprit. I had this identical problem with the Dailies Total 1. Good to see I was not alone in this. With the lens, my left eye's vision was perfect, but my right eye was always slightly blurry (and changing the lens power of just the right eye did not do anything to fix it). According to the doc, all the measurements were supposed to be a perfect fit (on paper). I didn't have this problem with my old contacts (or glasses) so I swapped back. First day trying these. I only need one in my left eye, my right eye is oddly okay. Being that I only wear it on one eye, I will probably always feel it, I didn't feel this one as much as others, but oh my goodness I can NOT get it out! after trying for like 20 minutes my eye is all red and dry, and I still can't get it. I had to take a break. I think I will be switching back to Acuvue for now, even though I feel it some, it is way easier to get out. Did you make sure your fingers where dry? Use a 100% dry, and clean, finger and push the lense down, down, down (without blinking) and then you can easily remove the DT1. If you blink start over and wipe your finger on a dry tissue and then move the lense down, down, down. i like these lenses but they are the most expensive on the market and i wish they had UV protection like Acuvue. Just tried a pair of Dailies Total 1. Keep in mind I have severe dry eyes. They felt great, but persistantly caused blurry vision and that is one thing I do not want to happen while wearing contacts. I am going to stick with acuvue trueye for the time being seeing how it has uv protection which is awesome and needed in my case. When I tried the Acuvue Trueye the light did not bother me as much as it normally does. When it comes to removing the contacts Acuvue wins. I had the Acuvue lens in for 12 hours and it was easier to remove than the Dailies Total 1 which I only had in for 3 hours. On top of that the mucus that tends to accumulate in my eye ended up getting stuck to the lens unlike the Acuvue lens where it would just glide off the lens and into the bottom of my eyelid. I only plan on wearing contacts for no more than 12 hours and then wearing my wiley x glasses the remainder of the day. I still have no idea of what the best contact for me is at this moment, but for now I will be using Acuvue Trueye. Had a lot of trouble trying to remove these lenses tonight. Was attempting to remove them for about half an hour. Made sure my fingers were super dry but no good. These really stuck to my eyes and they were too slippery to pinch out. Disappointing but they just don't suit me. I had the same experience in my optometrist's office when trying them on. I had to get the optometrist to get them out for me. Didn't like that at all! I just wanted to ask ya if you've ever heard of possibly needing a different RX minus spherical power for a different brand contact lens? Cause like for instance, I can see just fine with my Focus Dailies lenses without any issue really, but with my Biofinity and the Biofinity Energy lenses, for some strange reason with the same RX power and all, aren't providing me with the same clarity that I would come to expect for any contact lens! Like they almost seem a little on the weak side in a sense. Although I do find the Biofinity and the Biofinity Energy's to be quite comfortable on the eyes tho otherwise. I have had some similar issues with the optics with some of the other types I've tried out their too. It seems to be hard to find a Silicone Hydrogel lens that gives me the same precise vision as my Focus Dailies have, but would like a SIH lens to be more comparable to that lens visual and comfort wise combined if possible! Look forward to your reply whenever you get a chance. Yes! Between contact lens brands, materials, and curvatures some people will need different powers. That's why your prescription for contact lenses specifies the name of the brand in the RX - you might not get the same vision out of a -3.00 in different lens materials. Your doctor can assess for changes while you are wearing the lens to see what power change would give you better vision! It's really hard to get them out of eyes. Careful!